President Recep Tayyip Erdoğan addressing the crowd during an inauguration ceremony at the western Denizli province on Friday. Speaking in the western province of Denizli Friday, President Recep Tayyip Erdoğan said that Turkey would continue forward with democracy and that the constitutional amendment package "aims to move Turkey forward in a more democrat, liberal and prosperous way." With only 22 days left until the critical referendum to introduce a presidential governing system, President Erdoğan said: "Our aim is to move Turkey in a more national, domestic, democratic, liberal and prosperous way. We are talking about a domestic, national presidency, a Turkish-style presidential system. We have come this far via democracy and will continue on our way from now on via democracy." "Turkey is not afraid of renewal," Erdoğan underlined, saying that the "Governing system is being introduced for bigger projects and a stronger Turkey in the areas of democracy, economy and investments. We are not afraid of renewal. Turkish people throughout their history have never hesitated from achieving things that are good and beneficial, and we have always been a nation that promoted change." Noting that Turkey was unable to move forward in the past due to political and economic crises, Erdoğan criticized main opposition Republican People's Party (CHP) Chairman Kemal Kılıçdaroğlu over his "what was Turkey doing when everyone else was going to the space?" remarks, saying: "Oh Kılıçdaroğlu! During exactly those times, Turkey was dealing with coalition governments, dealing with disputes between the president and prime minister! Look how Turkey has developed over the last 15 years because there has not been a coalition government. We [referring to the Justice and Development Party [AK Party] have made our country leap forward." President Erdoğan promoted the infrastructure works that the ruling AK Party accomplished over the years. He said: "Our biggest trust is you, our people… The actual problem of those criticizing the system is that they know the people do not favor them." 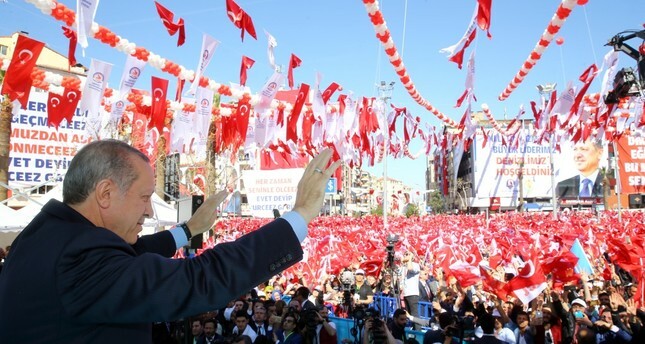 Furthermore, Prime Minister Binali Yıldırım addressed a large crowd at a referendum rally yesterday in Burdur and stressed that Turkey had spent too much effort ensuring political stability in the past. "Turkey has lost too much time and too many opportunities [to be developed]. If Turkey continues with the current Constitution, which is a coup d'état constitution, our losses will also increasingly continue. This constitution is no longer working," Yıldırım said. Prime Minister Yıldırım said that constitutions in developed countries function to govern the state in a simple way whereas the current constitution in Turkey causes trouble. He said, "It is the time to change the constitution, which blocks the way to effectively control Turkey." Referring to the coalition eras in Turkish political history, Yıldırım said that the country has suffered from a number of crises due to the current governing system. Yıldırım refuted the main opposition CHP's claims that the constitutional reform aims to establish one-man-rule as Yıldırım drew attention to the need to abolish the two-headed system "for the future of Turkey." "You [Kılıçdaroğlu] have participated in seven elections [as the leader of the CHP], you were the loser in all, and you are still the one man ruling the [main opposition] party. If you're looking for a one-man-rule [referring to CHP leader Kılıçdaroğlu], look in the mirror," Yıldırım added. Furthermore, the prime minister said, "The only authorizing group will be the Turkish nation after April 16 where nobody will be able to forcibly take the authority generated from the national will."